And you thought it was tough in Melbourne with the time changes wrought by the Commonwealh Games ( remember them? They were a week or so back. Didn’t think so.) Have a look at the fun and games in Sri Lanka. The BBC has a headline entitled Time to end Sri Lanka time split? Sri Lanka is a country divided not just by war, but also by time. Officially the country is six hours ahead of GMT. But in Tamil Tiger controlled areas, the time difference is five and a half hours ahead of GMT, the same as in India. Now that may change. So over in the blue corner, we have have Buddhist monks complaining that the time changes have upset the “spiritual plane” and that was why they got creamed by the tsunami. Seriously. If they change the time it moves them 500 miles on the spiritual plane and pesumably the tsunami goes sailing by to take out Africa. Now correct me if I am wrong but I thought that Buddhism held that this whole existence thing was an illusion and that was what caused the suffering. So time is an illusion (just check my diary) and it doesn’t really matter where you park on the spiritual plane. I suspect that The Venerable Gnanawimala just want’s to have a lie in on the weekend. 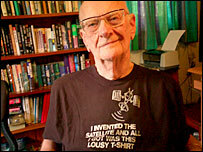 And in the red corner we have Arthur C Clarke (check out his tshirt) writing to newspapers over there saying “it is foolish to return to a time zone half an hour out of step with GMT”. “We should be in line with the rest of the world,” he argues. “It’s very inconvenient if we’re not. and in the green corner we have the Tamils, and I don’t know what they think of it. Amused perhaps?